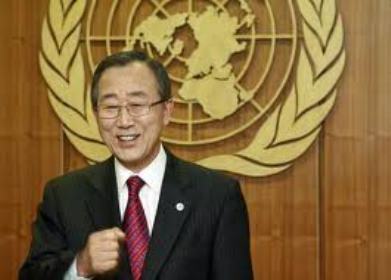 The UN Security Council on Friday threw its crucial support behind Secretary General Ban Ki-moon to win a second term at the head of the global body. The 15-member council held a private meeting to decide on its candidate to be secretary general. The backing was unanimous, diplomats said, and the UN General Assembly will complete the re-election of the former South Korean foreign minister next Tuesday. It is the only time when the Security Council adopts a resolution in private session, and while the closed-door nature of the meeting was reminiscent of the election of a pope, the encounter lasted barely three minutes. “The resolution was read out and everyone clapped instead of raising their hand, as it was by acclamation rather than a vote,” said one diplomat speaking on the traditional condition of anonymity. But instead of black smoke coming from the chamber, news of the crucial endorsement was announced by Twitter messages sent from inside by British, US and German diplomats. Gabon’s ambassador, Nelson Messone, president of the Security Council for June, emerged to read a statement to reporters confirming the recommendation. With no challenger for the position, Ban, 67, has been assured for many months of reelection to a new term which would start on January 1 and run through to December 31, 2016. The Security Council backing is crucial as the permanent members – Britain, China, France, Russia and the United States – could veto his new term. A small number of Latin American nations caused the only flutter on Thursday when they asked for extra time to get instructions from their governments before the regional group could give its backing. The delay was only temporary though. Every Security Council member and regional group has now backed Ban, whose main critics are human rights groups who say he has not been tough enough on major powers such as China. Ban has been outspoken in his support of Arab Spring demonstrators and on the Ivory Coast political conflict, annoying Russia and China who nevertheless have still publicly praised his work.